Okay, this website is ancient technology by today's standards, but I'm still including it here because it remains my most successful personal project. 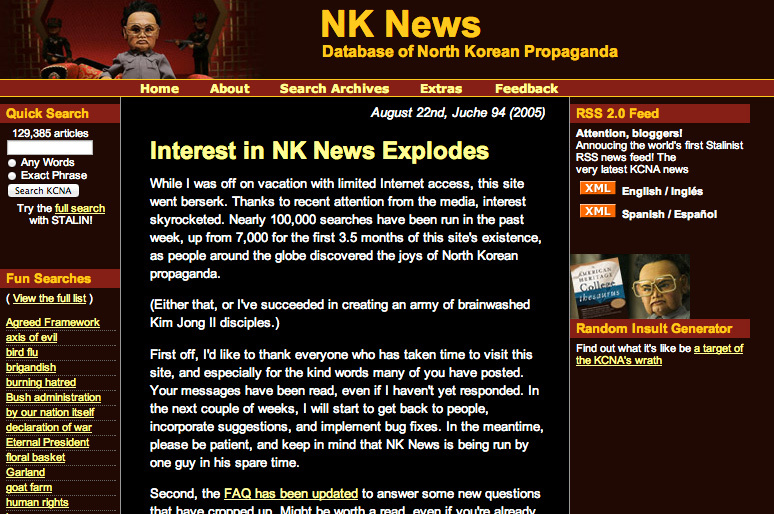 Using PHP and MySQL, I created a satirical website that collected North Korean state propaganda into a searchable database. This site received widespread media coverage, including articles in Reuters International, the Korea Times, and the Asian version of Time magazine, and landed me a short interview on national television for MS/NBC’s The Situation with Carlson Tucker. Several hundred thousand searches have been conducted with it. If you do a search for "Random Insult Generator" on Google, this site is currently #2.